Stress-Related Pain: What is it? and What do you do for it? Stress can cause many health problems. One of the most debilitating is mild to severe stress-related pain in certain areas of the body or all over the body. It can range from headaches to joint and muscle pain, chest pain, and more. 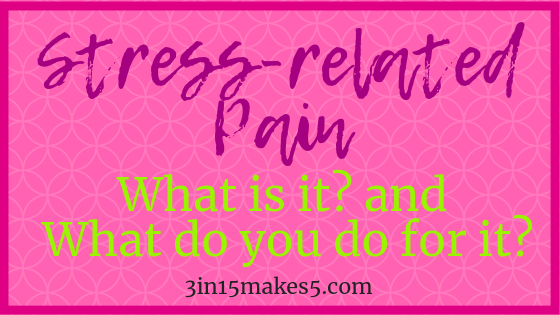 Continue reading Stress-Related Pain: What is it? and What do you do for it? There are some people who will tell you that they thrive in stressful environments. Stress pushes them to succeed. Others seem to crumble under its power. They are stressed out all the time. So, what is the truth about stress? Do you have a stressed-out brain? The leading cause of early aging is cognitive decline. As your brain ages, the capacity to learn, retain, and apply new learnings in life dies. Your cognitive ability includes attention, language, reasoning, memory, and knowledge. We need healthy neurons to maintain cognitive function. So, having stress can affect your thought process, making you an inefficient worker. However, you can do things to restore your mental prowess. How well did you sleep last night? Me? Better than the night before. And the night before, and…you get the idea. Which came first? The chicken or the egg? Or should I say, the stress or the lack of sleep? It could be either. Stress and sleep go hand in hand.